What comes to mind when someone says “backyard paradise”? 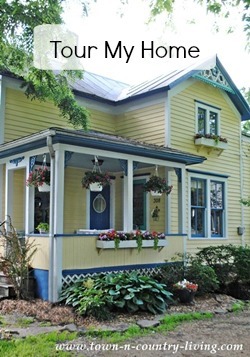 Do you have visions of your yard dressed like a vacation resort with all the bells and whistles? 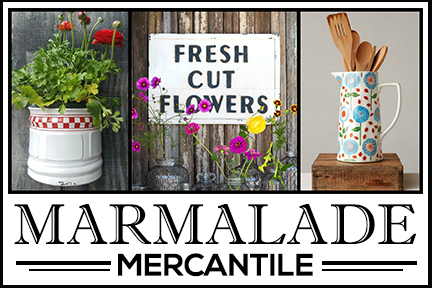 Chances are you envision comfy outdoor seating, waves of beautiful flowers, and areas for the family to gather and enjoy the great outdoors. For me, a paradise isn’t complete without a splash of water, because when I go on vacation I’ll always choose a waterfront location. So when I think of a paradise at home, it has to have a backyard pond. 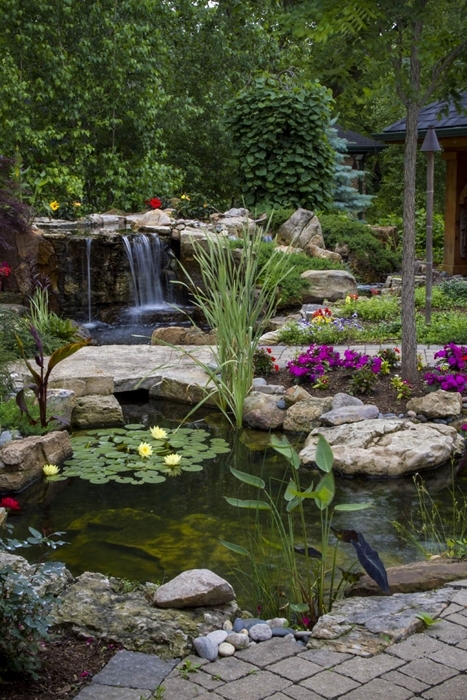 Lucky for me, I work for a water gardening company where I can enjoy beautiful backyards like this one. Friendly koi swim in the pond while waterlilies bob on the pond’s surface. 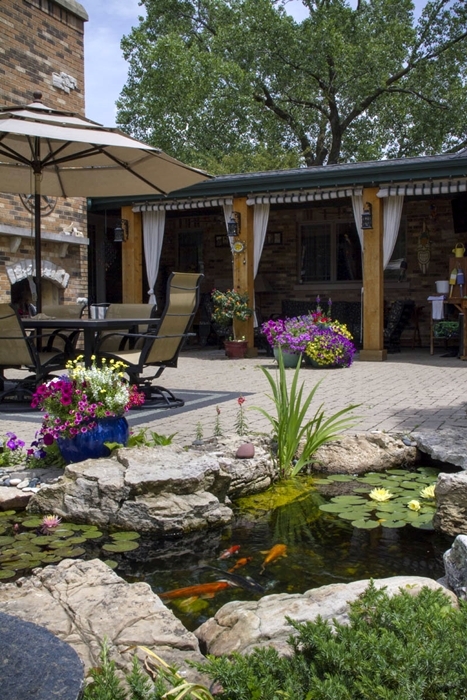 Who wouldn’t want to dine al fresco on the patio next to the backyard pond with its stone bridge that leads you to explore more of the amazing yard? Another angle shows the outdoor cabana in the background. The fish you see can be trained to eat right out of your hand. The experience is quite amazing and such an intimate way to enjoy Mother Nature. All of these ponds are in the Chicagoland area. Can you believe it? 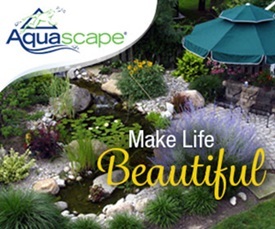 I work at Aquascape in St. Charles, Illinois as the marketing communications manager. We have a construction crew that is busy the majority of the year creating these gorgeous water features in suburban backyards. 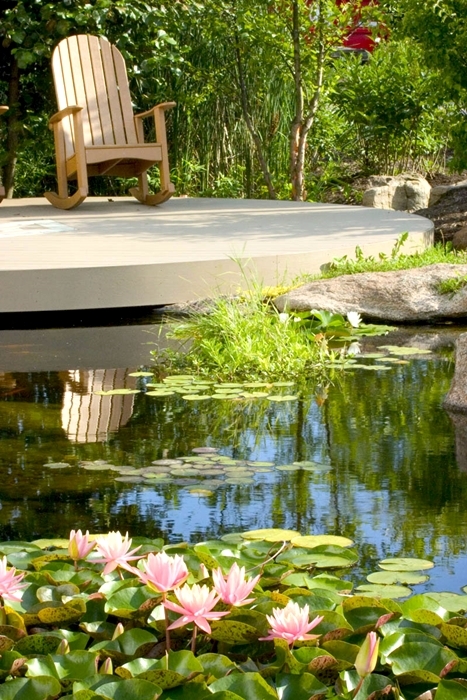 This particular pond has been featured in Better Homes and Gardens magazine. The koi are quite massive and friendly. This is one of my favorite landscapes. It just looks so peaceful and the perfect place to relax and unwind at the end (or beginning) of the day. 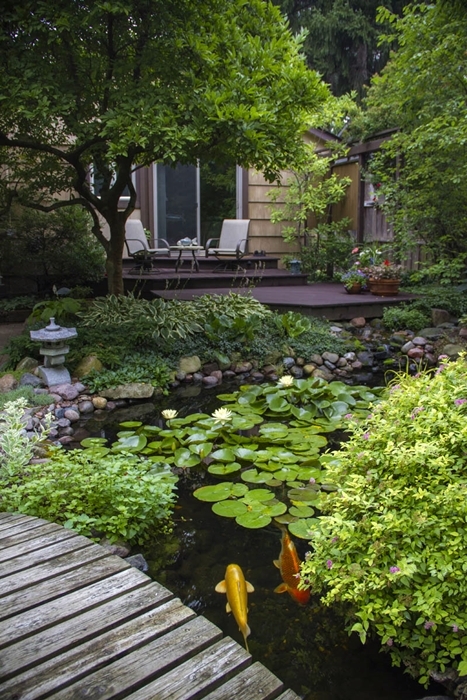 One of my favorite features of a backyard pond is all the amazing plants you get to enjoy. So many breathtaking waterlilies that bloom all summer long. 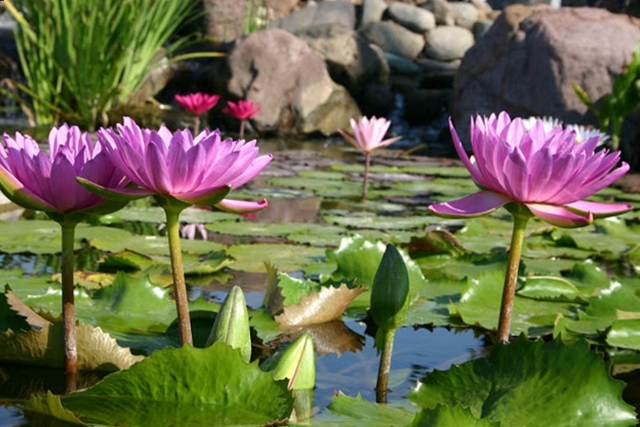 It’s not just the waterlilies though; there are so many aquatic plants that provide interest and color. 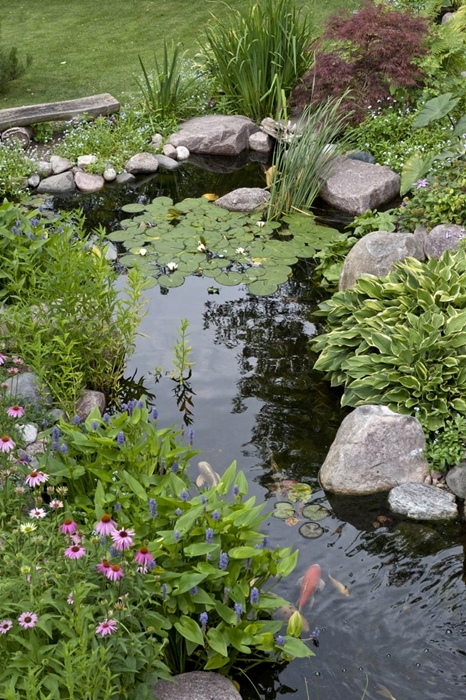 Plants soften the rocky edges of a pond and add color at the same time. I don’t have a pond in my own yard, but plan to add one when we move next year. You can create a paradise in the front yard, too. 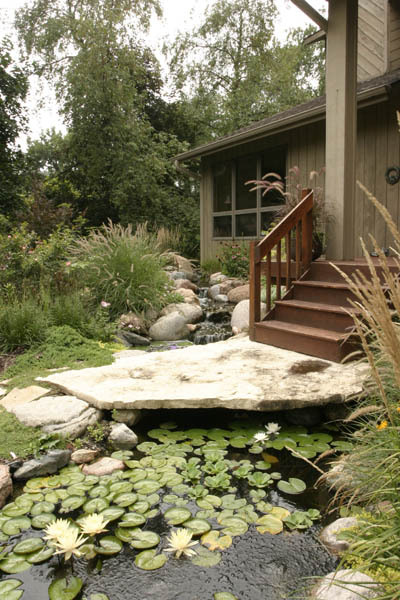 A backyard pond and waterfall hug the front of this house while a stone bridge provides access to the front door. What a great way to greet guests and family who come to visit. Wouldn’t you love to rock in that chair on the deck and enjoy this view? 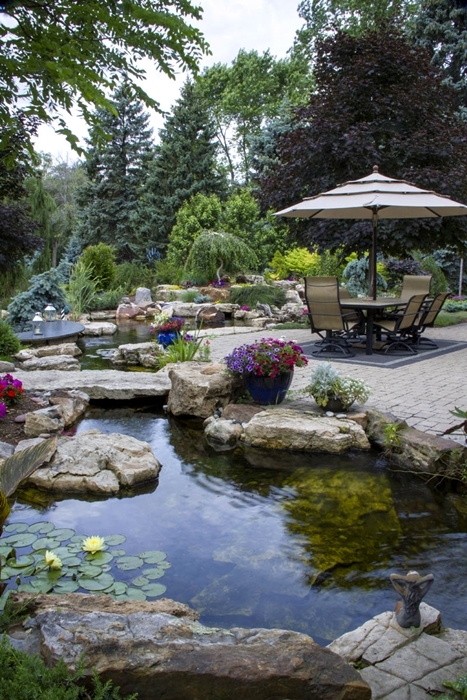 If you’ve always dreamed of a backyard pond, you might want to visit Melissa at Empress of Dirt. 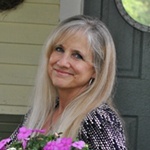 She just installed her own backyard pond by herself and is giving away a DIY pond kit to one lucky winner on August 4th! Gorgeous ponds! Where are you moving? Gorgeous ponds. They are so cool and refreshing looking.